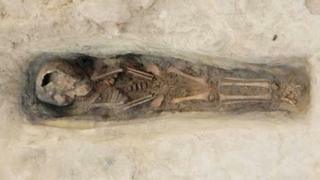 Four intact child burials made more than 3,000 years ago are among a series of recent discoveries near the Egyptian city of Aswan, officials say. One of the burials found by a Swedish-Egyptian team still had the linen used to mummify it, antiquities ministry head Dr Ayman Ashmawy said. The burials date from Egypt's 18th dynasty (1549/1550-1292 BC). Meanwhile an Egyptian-Austrian team discovered part of a cemetery and a Swiss team found a statue of a woman. The burials were found by archaeologists at the Gebel al-Silsila site. One was a tomb carved into rock for a child aged between two and three. In addition to the mummy linen, organic material from the remains of a wooden coffin was also found. Objects including amulets and a set of pottery were found in both the second burial - for a child aged between six and nine in a wooden coffin - and the third - for a child between five and eight. The fourth burial was also for a child of between five and eight. The new discovery would shed more light on burial customs as well as people's social, economic and religious life during the 18th dynasty, also known as the Thutmosid period. said Dr Maria Nilsson, head of the Swedish mission. So far 69 tombs have been found at the Gebel al-Silsila site, less than half of which have been excavated, Dr Nilson told the BBC. Most of the excavated tombs had already been plundered during antiquity, she said. Meanwhile an Egyptian-Austrian team working at a hill in Kom Ombo town uncovered part of a cemetery dating back to Egypt's First Intermediate period more than 4,000 years ago. Many of the mud-brick tombs contained pottery and other funeral items, mission head Dr Irene Foster said. She said the remains of a town dating back to the Old Kingdom (2613-2181 BC) were found below the cemetery and included a ceiling impression of King Sahure from the 5th Dynasty (2494-2345 BC). The third find in the area was that of an incomplete statue dating back to the Greco-Roman era. It was found in Aswan by an Egyptian-Swiss mission. The statue of a headless woman missing her feet and right hand was carved in limestone and is about 35cm (14in) tall. Local antiquities head Abdel Moneim Saeed said the dress worn by the figure had similarities to that worn by the Greek goddess Artemis.